Thus, the teaching mission of the Church comes from Christ himself. The responsibility for fulfilling that mandate passes on unchanged to the bishops and to all Catholics. 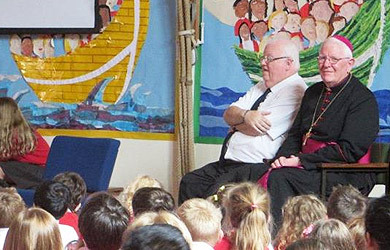 Within each Catholic diocese, the diocesan bishop is its principal teacher. The teaching authority of the Catholic Church, called the Magisterium, lies with all of the bishops who are led by the pope and guided by the Holy Spirit. The Catholic Church, therefore has the divine right and duty to safeguard, transmit, and celebrate the saving Gospel of our Good Teacher, Jesus Christ. The Church effectively and concretely embraces her mission in a myriad of ways, not the least of which is her work in the field of education. The pope and bishops are the authoritative teachers in the Church. They are assisted by clergy, religious, and lay men and women who serve as educators and catechists in Catholic institutions, including elementary and secondary schools, colleges and universities, seminaries and parishes. Catechesis is the act of handing on the Word of God intended to inform the faith community and candidates for initiation into the Church about the teachings of Christ transmitted by the Apostles. It also involves the lifelong effort of forming people into witnesses to Christ and opening their hearts to the spiritual transformation given by the Holy Spirit. 1. Parents are the choosers. Parents are the primary educators of their children, and the choice of schools for their education must be made by the parents. Their primary obligation toward their children is to get them to heaven. 2. The goal of each life on earth is to know, love and serve God here and to be happy with Him in heaven. The purpose of Catholic schools is to help the students keep that focus, and offer assistance every day throughout the day to meet that goal. 3. Where there is not the whole truth, there is some lack, some untruth. Although there may be other alternatives to a Catholic school education, unless it is truly Catholic, it is wanting in some areas of education, understanding of the person, or philosophy of education. 4. The dignity of each person, an acknowledgement of each person’s uniqueness and talents, is based in the acknowledgement that each child is a gift from God, and a child of God, made in His image and likeness. This is the basis of a caring and loving school community. 5. The understanding that God is our Father, that He sent His Son to win heaven for us, and They sent the Holy Spirit to instruct us in all truth, is the motivation for the opportunity for daily Thanksgiving in daily Eucharistic prayer. 7. Growth in all levels of academic achievement is important for the personal and civic responsibilities of life in this world. 8. There are opportunities for personal contacts and friendships with people who share the Catholic faith. 9. Parish life and growth in community, in care for others, in participation in a local parish is achieved more easily and completely by families who have or had children in the parish school. 10. Vocations to the married life, priestly life or consecrated religious life are nurtured through the whole school atmosphere of understanding and preparing for a response to one’s vocation, to the call from God. 12. Jesus Christ is the model for all students, reflected in the personnel hired, the daily schedule, and in the text books and resources used. 13. 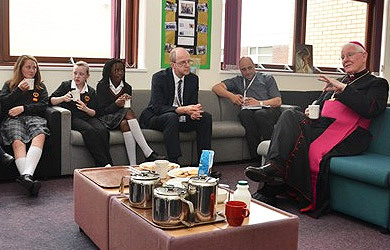 The Synthesis between culture and faith is one of the most essential elements of a Catholic school.